It looks like Louis Van Gaal has benefitted from the season of goodwill and has managed to make it to 2016, still gainfully employed by Manchester Utd. There can’t be much road left for him, though. The draw against Chelsea some days back was their best result from the last five games. This game against a woefully poor Swansea might just be the break they need to start the new year on a good foot. To be honest, as poor as Swansea have been, it’s slightly unfair to label them as ‘woeful’ at the moment as they have shown slightly better form than their opponents. No losses in their last three games and a win in there to boot represents a massive upswing in their fortunes this season. They are still without a manager as previous boss, Garry Monk, was given the heave-ho some time back but in lieu of a ‘new manager bounce’ they seem to be having a no manager one. At this stage, they’ll take whatever works. Watching the analysis (such as it was) following their recent 0-0 draw with Chelsea, one was put in the mind of Alice falling down the rabbit hole. The match itself, especially the second half, was one of the worst attempts at football this column has ever seen but to listen to the pundits afterwards, you’d be forgiven for thinking that your eyes had been lying to you such was the level of praise lavished upon Utd and their captain, Wayne Rooney. They did their best to put lipstick on the pig but it was still a pig. The pressure is very much on the Utd players to perform for their manager. They may not like him or his stubborn methods but they will be well aware that if they slack off now and the manager does get the sack, the next one may not look so kindly on their mutinous efforts. And there is of course a question of professional pride so will they be able to shake the torpor from themselves and take three points from the shaky Swans? Ordinarily you would expect so but these are hardly ordinary times at Old Trafford and they are looking dodgy all over the pitch. In reality, this might be just the game Swansea need to get their year off to a roaring start. So, with optimism filling our boots, we will go all out on a Swansea win in an awful match with BetVictor offering 7/1 for that result. A London derby to get the pulse racing, 5th place Palace welcome 14th place Chelsea. The visiting side might, just might, be on the cusp of a breakthrough in terms of performances – it’s now four games since they last lost and given their form so far this season, that counts as progress. In their game against Man Utd, they were denied the three points by some incredible goalkeeping from David de Gea but for all their thwarted chances, they often resembled a rag tag of Sunday morning footballers, making the game up as they went along. They possess the caliber of player to finish in the top ten and maybe even challenge for one of the Europa League places but put against a good team, they will struggle. Lucky for them they didn’t face one in Utd but they will against Palace. Strangely enough, Palace have drawn their last two games to nil (Chelsea have also drawn their last two); they had only drawn two games prior to that all season. Does this speak of mid-season slump or did they simply hit the Christmas food a bit hard? For their sake, one hopes it’s the latter because to lose at home to Chelsea would be just embarrassing. If they get back to their ‘old’ ways, they should be well able to account for a Chelsea team that has taken to leaking goals against any team that possesses a decent set of forwards and Palace have a savage set of goal grabbers, when in form. In this column’s incredible opinion, a Chelsea win is unlikely so it’s a toss up between a draw or home win. Given the slight upswing in Chelsea’s fortunes and the blunted recent form of Palace, a draw is probably the most likely outcome. A load of bookies seem to concur, ToteSport being one of many offering 5/2 on that score. This could be the match of the weekend. As a result of their form over the Christmas period (three consecutive wins) their odds of being league winners have halved from 22/1 to 11/1 and will probably continue to shorten should they keep progressing in this manner. Spurs have the best goal difference in the league as a result of goals in and out – their defence is the meanest in town and Harry Kane, after a little wobble at the beginning of the season, is back amongst the goals again and scoring for fun. Moussa Dembele, so long a persona non grata at the club, was given the chance by the boss to show what he can do and he has been hugely impressive, confirming the outlandish talent many thought he had. Sadly for Spurs, he was injured in their last match and has been ruled out for the next few matches. Everton are a strange one and of that there is little doubt. Only two teams have scored more goals then them and yet they have a goal difference of just seven. That might infer that wunderkind defender, John Stones, isn’t quite the player he was made out to be or, more likely, it could be down to the fact that organizing a defense isn’t Martinez’s strong point. And to be honest, this could be the issue that will eventually see him lose his job. As it stands, Everton have some of the most exciting young players in England. From Lukaku to Barkley, Deulofeu to McCarthy and many more besides, this is arguably the best Everton team in a long number of years and the fans know it. They have played some exhilarating stuff and yet they are 13 points off the top, sitting in 11th and just three points ahead of West Brom. For a team that promises so much, they are delivering precious little and patience with that state of affairs will not last for very long. 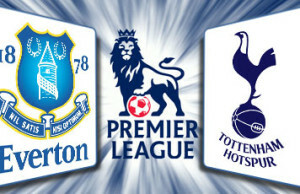 Tottenham have been the form team over the last fifteen matches and will come into this game confident of putting Everton to the sword. Everton in turn will fancy their chances of scoring a few but this column fancies that they’ll concede some, too. The bookies make Tottenham to be slight favourites here and there doesn’t seem to be too much of a reason to doubt them. Spurs to win at 17/10 from WilliamHill.